It's time to review "the boss"! 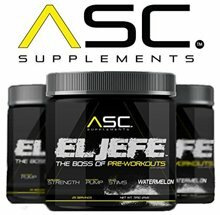 PricePlow's Robert and CJ's El Jefe pre workout review shows some MAJOR clumping issues. Is it really the BOSS? *THE MOST POTENT & COMPLETE PRE-WORKOUT: 22 active ingredients at clinically proven dosages with 29 grams per serving. EL Jefe give you the best workout and enhance your performance, give you an amazing pump, provide laser focus and explosive energy. *ALL ABOUT QUALITY: Each ingredient in this product is of the highest quality available on the market. You will get the best ingredients with every scoop. This product is made in a GMP certified lab. *UNISEX: This product is for the use of both males and females! *100% TRANSPARENCY: While other supplement companies use proprietary blends to under dose ingredients to save them money, El Jefe pre-workout keeps it honest. NO PROPRIETARY BLENDS – what you see is what you will get! *100% Satisfaction Guarantee: This product will give you everything you need and more from a pre-workout supplement to enhance your performance and get you results. We are so confident in our product, we provide a money-back guarantee. An investment in this product is an investment in your health, and we appreciate your decision to choose our product. Even if you didn’t love our product, we will always support you.